We have one new Pinterest board up this week to prepare you for next week’s festivities. Our Scary Faces board is filled with treats for those who want to trick-or-treat for type goodies on Halloween. From images that scream bloody murder to fonts that will claw their way into your design instincts, we have a collection of spiky fonts available on FontShop and haunting images from fStop. If you’re not bothered by paranormal activity or snowy TV screens, you’ll find some spooky fonts you might like such as Static from GarageFonts or Alphabat Regular from Linotype. If you’re more likely to be watching movies like The Prophecy or The Exorcist next Wednesday night, you might be more interested in Exocet and Mason Serif from Emigre. Stop by our Pinterest page for some visual treats like FF Pitu Pro! We have one new board up this week that focuses on typography from Japan! I recently came back from a week-long trip to Tokyo and didn’t forget to pay attention to the typography overseas. Many of us are used to seeing an A through Z alphabet or any mix in between, so it was definitely a change to be in country where the language is portrayed in more than just the Latin alphabet. I hardly know how to speak or read most Japanese, but I can still appreciate the beautiful brush strokes and the sharp turns of the different Japanese alphabets (hiragana, katakana, and kanji). Of course, there’s also the romanization of Japanese (romaji), so I was able to snap a few shots of letterforms many of us are more accustomed to seeing. 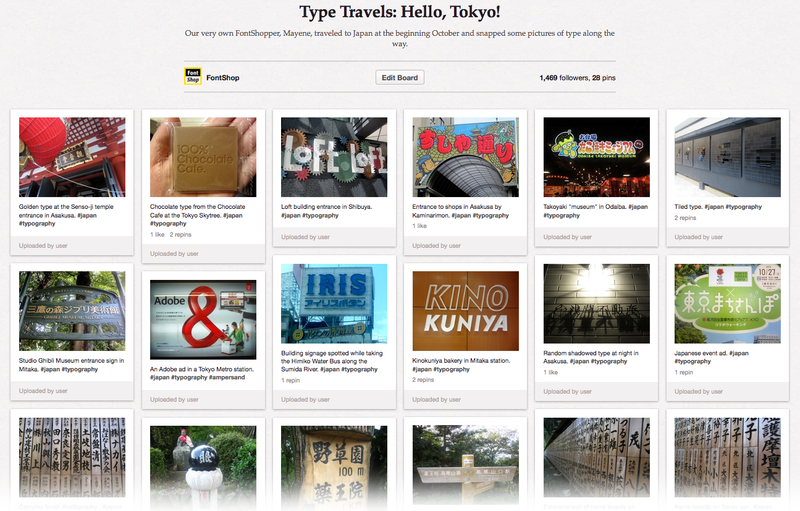 Visit our Type Travels: Hello, Tokyo! board to see what I saw during my stay in Japan! Also, in honor of Snoop Dogg’s birthday tomorrow, don’t forget about our Nuthin’ But A G Thang pinboard and check out some Gs! Fontshopper, we’re showin’ you some fonts so you can just chill if you’re the type that needs their typography fill. We have one new board up this week and if ya got five (minutes), we got fives. I Got 5 On It is a pinboard collection of various 5s from different font categories from Ayres Royal‘s swashy blackletters to HGB Lombardisch‘s deliciously inky glyphs to bold display faces like Parkinson Type Design‘s Sutro Shaded Initials. Homies don’t play around, we down to gaze around, then ease up once we’ve had our fill of Pinterest with Fontshop. We have a few new Pinterest boards up this week including our X Marks The Spot board that we created especially for those who were plunderin’ for typographic treasures on Talk Like A Pirate Day. On our Alphabetized board, we’ll be pinning interesting finds that showcase full alphabet designs ranging from posters, unique fonts, home decor, and character sets designed just for fun. In line with our Typographic Trend this week, our Let’s Get Physical board contains images and items of type in the physical world as well as three-dimensional fonts including Buster OT from Elsner+Flake designed to appear like the letters are popping up from the ground and Ironmonger Three D OT from Font Bureau, sharply chiseled down to catch your eye. If you love our pinboards and have friends on that are in need of some typographic goodies on their Pinterest feed, spread the word! To welcome the new season, we created one new board this week that will remind you of school days gone by. Our Back To School pinboard is a collection of images and fonts that are reminiscent of playgrounds, chalkboards, and learning how to connect your letters in writing with that thing called cursive. From fonts that remind you of elementary school like Lemonade Std Regular to fonts that hold memories of pep rallies and high school football games such as Yearbook Std Solid and Princetown Com. Also, while our Sew Creative board isn’t exactly new this week, did you know September is National Sewing Month in the US? Get crafty with fonts like Stina Regular OT and the P22 Folk Art Set! As things kick off in London today, we’ll be pinning athletic design inspiration on our Fontlympics 2012 Pinterest board. Next week, we’ll be hosting the Fontlympic Decathlon on our blog. The five typefaces that will be competing against each other in various events next week will be showcased not only on the blog, but the Fontlympics Pinterest board as well — you won’t want to miss out on which face will be crowned the best all-around typeface! Besides the Fontlympics, we couldn’t contain our excitement for the release of the Dark Knight trilogy finale last week and took a look into the use of typography in the bat years gone by. From the onomatopoeia discussed on the FontFeed a couple months ago to the comical lettering of Adam West days, Batman has flown through sharply edged letters to shiny type to serifs and finally down to simple sans for the Dark Knight trilogy. Check out the typographic evolution of Batman beginning with movie posters from the 1940s on our Holy Typography Batman! Pinterest board. On our new Mugshot board, you’ll find a selection of coffee-themed fonts and matching images from fStop. Every time you feel like you’re having a case of the Mondays, head on over to our Pinterest to find type samples and images that will make you feel better. Just like webfonts and OpenType in the font world, there’s no escaping Pinterest in the social media realm. We created boards to share with you on Pinterest — from new fonts to type in the wild to inspiring typography designs, we’ll be pinning some of our favorite finds from around the internet as well as showing off the great fonts we have available on FontShop! If you miss an update or like to go back to see old posts such as our Staff Picks, our Pinterest boards will be a good source to keep you up to speed with our happenings. New fonts available on FontShop and any announcements can be seen on our New & Noteworthy board and helpful resources we have to offer can be found on our Typography 101 board. If you’re feeling nostalgic, we also have a visual list of the fonts that were featured in our Best of 2011 newsletter last year. We’ll be recapping our Best of 2011 Typefaces through Pinterest with more eye candy for your typographical needs. Every week, we’ll feature a typeface and showcase examples of fonts in use as well as relevant images from fStop with our “In Your Face” boards (e.g. Bello Pro). You’ll also be able to learn more about type designers with our “Designer Spotlight” boards (e.g. Goudy), which will focus on their work and influence. We like to have fun here at FontShop — if you’re Pinterested, check out some of our other boards: Swashbucklers, Drop Cap It Like It’s Hot, and Amplified!